The Geze TS4000EFS Size 2-6 Silver Fig 1 C/W Arm Electro Mag Door Closer 124866 features an electric hold-open device with adjustments between 80 and 175 degrees. 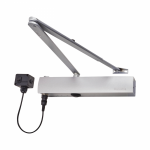 It is approved for use with left-hand and right-hand single action doors and with a door leaf width of up to 1400mm. It is convenient for installation on fire and smoke protection doors. Despite the fact that a electro magnet door closers is paramount for fire emergencies. This product is perfect compared to other electromagnetic door closers because it enables people to pass through the door without applying too much physical force especially in the mornings!